Blog Trek, the next generation: Better to work in corporates! Really? Hi! This blog is testament to the fact that the voices in my head are truly out of my control! Rather than going crazy about it, i've decided to channel them constructively! Better to work in corporates! Really? This statement, though bringing relief, is inaccurate, and here I’ll try to explain why. The bad experiences of people who have worked with NGOs who are following dubious practices, like keeping themselves funded with the appearance of helping downtrodden groups while actually not really doing much, stem from the fact that they were on-the-ground, and got an opportunity to see what goes on behind the scenes. They got a touch of what’s really happening, and so were in the position to be able to judge on the ethics of it. In the corporate sector, this privilege, of being in touch with what’s really happening, simply isn’t there. Corporations are absolute top-down dictatorships, with vetos practiced at every level. The employee, let’s take an example I’m familiar with… a programmer working for a tech company, is only exposed to the details that are necessary for the job. One is completely insulated from any unethical act being carried out by the bosses or their bosses and so on. 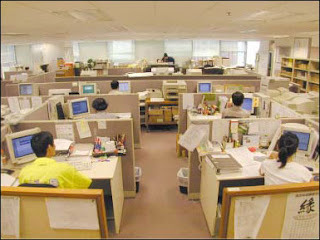 While at the same time, one’s work creates value for the bosses and empowers the bosses to continue or increase exploitation. In the IT company I’d worked at, Halliburton was a prized project to get into among my fellow employees. The myriad technical operations they were helping to redesign and improve were helping to make the US occupation a more efficient, larger-scale plunderer of the resources and the people of Iraq. At lunch they’d chat about all the bad things being done there by world powers, and then they’d go right back in, work overtime and weekends, and chip in to the plunder with their creative ingenuity and hard work. They’d have regular office parties, would celebrate team members’ birthdays and achievements, use the company corpus to go on nature treks, etc. They’d also run routine green campaigns like using both sides of papers to print, avoiding printing too much, optimize air conditioning, switch off the lights and turn off the computers when the work was done, etc etc. All very nice people who cared for their families and stuff. But why just pick on Halliburton… the other projects too : Banks were automating processes that helped them lay off thousands of employees and make their foreclosures and debt traps more efficient and devoid of human concerns, retail chains took programmers’ help in expanding their supply chains, hence enabling more rainforests to be wiped out faster. I want to paint a picture to describe this. 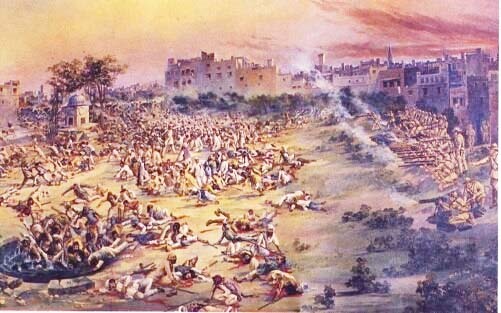 Imagine the Jalianwalla Bagh massacre. The vast majority of the corporate employees at this scene, would know nothing about what they were actually doing. Yet it’s the “hard, honest work” they put in, their dedicated obedience and professionalism, that makes the ensuing massacre happen. When your actions are “technicalized” and compartmentalized to such degrees, even the most abhorrent of acts can be participated in with full enthusiasm without any bad/sad feelings. As you progress in your corporate career, because of your increasing roles and the need for some oversight and integration, a little of the blinders have to be removed, just a little. 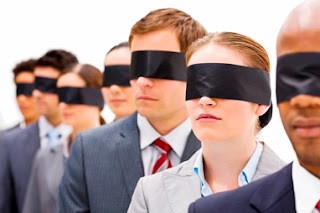 By that time, most employees are so well indoctrinated, so dependent upon the earnings from their work, that many are quite successful in ignoring what they see, hence internalizing the blindfold. Many channel the real-life inputs they’re receiving in other ways, like joining a cause on the weekends, like planting some trees, like donating to an orphanage once a year, like providing for one child’s education. I will not discount the role of intuition and the connection with the rest of the universe here: it is vital in eating away at the blindfolds and remains to this day the one thing that the corporate engines suffer the most damage from. They’ve designed for everything that can be measured and explained. Hence they are most vulnerable to the forces of life that cannot be explained. Many NGOs are formed to receive and implement these generosities. The inherent hypocrisy, the reality, however, of stealing Rs.10,000 and giving back Rs.1, manages to claw its way through, and it is this twist, this conflict that manifests in the NGO’s operations, and this is how many org’s operatives catch the dubiousness. Because they don’t have the blindfolds wrapped on as tight. The malpractices of many NGOs that are visible, are inherited, manifestations, of the relatively invisible malpractices of the corporates and high-net-worth individuals that fund them. Initially it’s taken as a necessary adjunct to the large amounts of funding that make implementing their cause possible; but over time the duplicity claws its way through into other spheres of their work, and causes things that don’t have any direct relation with the funding compulsions. In the NGO I worked with (they liked calling themselves a movement), this manifested in the managers abusing their power over us in the name of supporting us, and doing many things purely out of ego, spite and paranoia resulting from the awareness that they were not really doing what they were portraying. This is what people mean when they say “Compared to these NGOs, we’re better off working in the corporate sector”. It’s because there is no immediate moral hazard, because water-tight systems are in place, because the start and the finish are so far apart, because there is nothing to tell you exactly what the consequences your work has on the real world. But just because you do not see those real life consequences, does not mean that those consequences are not actually happening. So, dear friends, I don’t mean to say anything in favour of any one side here. I only ask you to connect the dots and think about this again. And if you are feeling any despair about “both options being traps”, then I would urge you to consider the possibility that we are not living in a binary world. Other ways of engaging with the world, and sustaining ourselves, exist. Everyone has a role to play somewhere. Exclusivity is not essential. Hybridizations are possible. And there is no need to try to jump from one absolute bastion to another. It is ok to act in relative terms, so long as you're being true to yourself. Transitions can include anything in the middle, all you need to keep in mind is what you want to be transitioning to, and whether what you’re doing is helping that transition or hurting it. I think you may have generalised corporates just like some people generalise NGOs. There may be many corporates,small businesses and NGOs who do not indulge in such practices. Hi Onkar, thanks for commenting. I wasn't writing about small businesses. I was writing about big corporates. And I think the word "indulge" may be inappropriate. To remain in the game, they don't really have a choice in the matter. With the chain of operations being so long, it gets conveniently difficult for people to see how their particular fragment is involved in the chain of exploitation. That's why I shared my company's example. And there's also the unstated assumption that the financial system as it exists today, with its incentives to externalize costs and its bias towards conglomerations, is proper. Anyways, here's a good opportunity to make a real life test : Let's share one name of a major company that we feel isn't involved in any sort of unsustainable practice (by that I mean unsustainable from the point of view of planet Earth). And let's explore where all their sources of revenue come from. Note: please don't waste any time illustrating all the nice things they do as CSR. Creating 100 problems and then making grandiose gestures to solve one doesn't make one a nice company. This reminds me of something shared in the book "Disciplined Minds" by Jeff Schmitt : If you ask a nurse or a public school teacher or a farmer or a barber to do some CSR, to "give back", they'd scoff at you. Because their jobs aren't stealing anything from society to be giving back. It follows that the professions where giving back to society is seriously considered, are the ones stealing from society, exploiting the ecosystem. And the more exploitative the profession, the more honourable it is to "give back". Would you like to show your appreciation for this work through a small contribution? Fwd: tool most important to humanity's survival? Blog Trek, the Next Generation is shared under a Creative Commons Attribution-ShareAlike 4.0 International License. Hoping that one day we can understand one another. All posts published for free and open use - feel free to copy, quote, share, whatever.. Picture Window theme. Powered by Blogger.